It’s perhaps not surprising that this song isn’t so much familiar to me as part of my DNA. My father served in the Royal Navy for 35 years rising from a ‘below the deck’ rating to the giddy heights of Lieutenant Commander on the Special Duty list for survival equipment when he retired aged 50 to become a Baptist Minister and eventually a missionary to Brazil. My mother was in the Women’s Royal Naval Service (a “Wren”) and indeed my parents will tell you they met over the engine of a Phantom jet they were repairing. My brother spent time in the Royal Naval Reserves and I myself have spent two years on a bookship in South East Asia, New Zealand and Australia. Growing up I attended churches on base, onboard, or in naval towns such as Gosport, across the harbour from Portsmouth and its naval dockyard. I even spent some time working in a seaman’s mission at the dockyard gate on Portland. That’s probably another whole article right there. “Eternal Father, Strong to Save”, or occasionally “O Trinity of Love and Power” and perhaps more properly The Naval Hymn, is a very familiar hymn from such settings. It may be used at the start or end of a service, especially on Sea Sunday; or perhaps at an appropriate point in a service such as at a commemoration or funeral1. It’s more than just another hymn, however. Thanks to its familiarity and its association with people and places, past and present, it is powerfully moving to seafarers and their families. It was written by William Whiting in 1860, an Anglican from Winchester, not very far from my home town of Gosport. He was apparently inspired by Psalm 107 and his own belief that God spared him from a storm whilst at sea. The words were published the following year in Hymns Ancient & Modern (an incredibly influential hymnbook still in use in one local church I attend). Meanwhile, John Bacchus Dykes, a canon (and precentor) of Durham Cathedral, wrote, amongst others, a tune called Melita to go with the hymn in the edition of the hymnbook which came out the following year. Melita, an archaic form of Malta which was then a British colony2, is in 88 88 88 iambic metre (or “long particular metre”), which essentially counts the syllables of each line and means that many hymns can be sung to the tune. However, such is the tie of Melita to “Eternal Father”, I think I’ve only come across this on one occasion in my life. Given my history with it, I’ve long thought of doing a ‘spacer’ version for Traveller and had scribbled down a line or two but not much more. Finally a couple of things came together which meant I knuckled down to write something. Firstly, I had been running my adventure “The Second Scions’ Society” in library lunchtime sessions at work and had gone past the ‘end’ of what I’d written for its TravCon outing in 2013. We were getting to the bit just after one of the PCs hears about his father, Count Spirn, and brother dying in an air/raft accident. The scion has now become the Count as the surviving heir. Jumping homewards on Father’s yacht which he’d been borrowing (think Downtown Abbey in space, not your paltry standard Traveller yachts! ), the Count’s chaplain has arranged a memorial service in the onboard chapel. It seemed like just the moment for such a hymn and having produced it as a handout for the players I found they were keen to give it a go. Despite the slightly odd feeling of us singing together and the humour of having to keep our voices down so as not to disturb nearby students outside the room, it was quite affecting! The second factor in motivating me was the replacement of my old android tablet with a Galaxy Book – essentially a tablet/laptop combination using Windows instead of Android. As well as its keyboard cover, it comes with a capacitive stylus. I happened to stumble across a piece of software called StaffPad when looking for something else and connected up a lot of dots as I suddenly realized this might be what I’ve dreamed of having for many years now. I’m not much of a musician – although I did manage to get an O-level in the subject (aged 16) and even passed a couple of piano grades as a schoolboy until my teacher went off to get married – but have long messed around on Commodore 64 and Amiga computers. However, I never loved early music software with its computer-focussed notation I didn’t know and never got my head round. I’ve learned to read music, why can’t I use a proper stave!? StaffPad did just this and without the eye-watering expense of current software I was vaguely aware of (Finale and Sibelius, I’m looking at you). It does require Windows and a capacitive rather than touch stylus, but that just happened to be what I had in my hands. Something bought to write Traveller material more easily (in bed, on the bus, etc) and read Traveller PDFs anywhere, might have a wider use. So it was an obvious choice to take the plunge, dig out some old manuscript attempts to write music, create proper sheet music, and finally hear them as they meant to sound. (I can write material which is more difficult than I’m able to play. Which isn’t hard, to be honest). It wasn’t long before my attention returned to The Spacer’s Hymn. 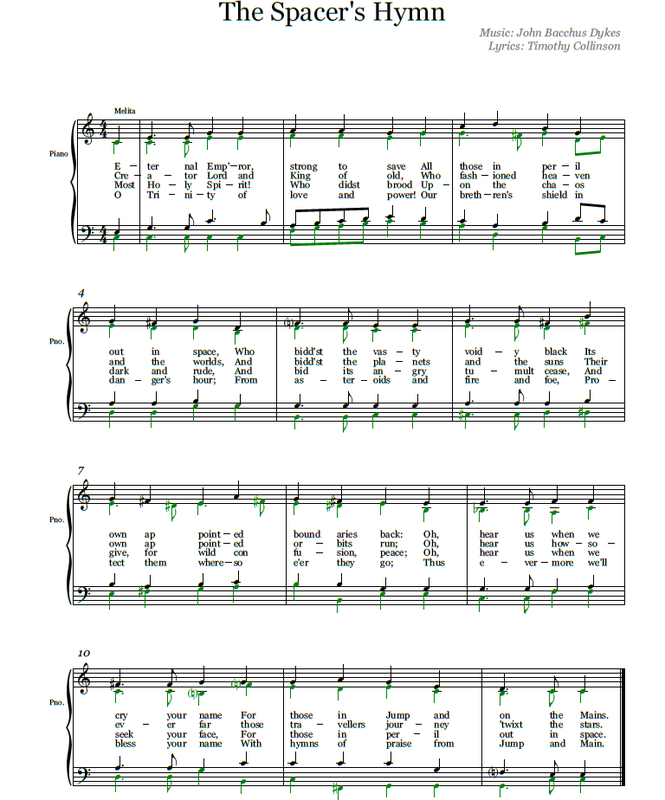 Being able to produce the sheet music for the hymn rather than just the words seemed to make it more of a thing of it to submit to Freelance Traveller. I’ve not used StaffPad for long, but I’m quite impressed with how flexible the software is and how able it is to deal with relatively complex scores; particularly for the price. Theologically the hymn, like the United Kingdom’s national anthem, is a prayer, in this instance, to a creator God and with a strong Trinitarian theme. One version of The Spacer’s Hymn I produced dropped the direct reference to the Trinity (although it was still implied by the verses). For those who want to de-emphasise this aspect, the word could, for example, again be replaced with ‘emperor’, in the manner the ancient Chinese might refer to God as Shang-Ti “heavenly emperor” and of course connecting very nicely with Traveller’s Iridium Throne. So anyone running a Traveller universe of types 2, 3 and 4 (“Dare to Go There”, Freelance Traveller, Sept./Oct. 2016) as regards religious content could easily use this with monotheistic religions, dualistic religions or even polytheistic religions which posit a creator – or at least a Lord of Jumpspace, normal space and/or travellers. The creator may or may not be ‘interactive’ – this could be a desperate plea under God View 7 or 8 (Crisis Monotheism or Remote Monotheism) that doesn’t expect much in the way of an answer, or – as intended here – a prayer under God View 5 (Interactive Monotheism) or possibly 6 (Influential Monotheism). Other God Views might be feasible. Pantheism (God View A) – God is in everything so must therefore be in space and Jumpspace or even Polytheistic Animism (God View 1) with the various natural phenomena of space, Jumpspace, planets etc associated with specific gods. See DGP’s Grand Census or World Builders’ Handbook for more on the Universal Religious Profile. I could imagine trinitarian old style congregations using such a hymn, perhaps a group such as the Disciples of the Bright Way might as well. Other potential religions can be found in BITS’ 101 Religions (or the inclusion of it in Supplement 15: Powers and Principalities). It could even be a cultural appropriation outside any particular faith community. It’s not impossible that Aslan of a religious nature might use something similar, just possible the Vargr might and not at all likely the Zhodani would use such a form – unless it was indeed some kind of cultural appropriation. I was surprised to discover when looking into the background of the hymn that it has been adopted by, and had verses written for, various other United States military organizations and such like in addition to any use by the US Navy: the US Marines, the US Coast Guard, submariners, astronauts and others. Some of these additional verses can be found in the Wikipedia entry for the hymn. It’s left as an exercise for the reader to write verses of The Spacer’s Hymn for the IISS, Imperial Marines, and so on. In any case, given the dangers inherent in any kind of travel, but particularly space travel in an adventure setting, characters might be looking for whatever edge they can get. For those in Jump and on the Mains. Those travellers journey ’twixt the stars. For those in peril out in space. With hymns of praise from Jump and Main. Editor's note: Both Wikipedia and Singing the Faith Plus have embedded audio of Melita being played, with differing tempo and style. Mr Collinson submitted a MP3 file of Melita being played on a piano, synthesized by StaffPad. Because of the editor’s own experimentation (discussed below), and with Mr Collinson’s approval, we are not including that file here. Your Humble Editor has his own music software, Harmony Assistant, which seems to be similar in capability to StaffPad. When this article was submitted, YHE decided to copy the music into Harmony Assistant and see what could be done. The first result was a MP3 file of Melita being played on an organ. Being encouraged by the results, YHE turned on Harmony Assistant’s “Virtual Singer”, and generated a MP3 file of the Spacer’s Hymn being sung to the accompaniment of the organ.